Children of sailing enthusiasts will likely be forced to either enjoy or endure their parent’s passions so for happy and successful family cruising holidays it is in everyone’s best interests to make sure that each passenger’s experience on the ocean wave is an enjoyable and safe one. 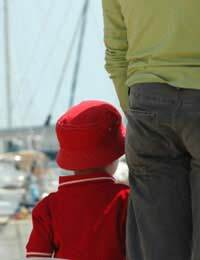 When sailing with young children on board it is worth bearing in mind a few standard rules to ensure the safety and enjoyment of everyone on board. A child should wear a life-jacket at all times whilst on deck or near the water and parents are wise to set a good example by doing likewise. Children should not be allowed to run on deck and should hold the guard rail at all times when moving forward out of the cockpit. It is also important that young passengers are able to swim. Adults must be responsible for making sure their children are wearing the appropriate clothes for the conditions and should also take along essential extras such as suntan lotion, sunglasses and sunhats. Whatever the weather, warm and waterproof clothing and non-slipping deck shoes should be the first things packed in the suitcase before departure. Children have short attention spans and the initial excitement and novelty of being on board a sailing vessel at sea can wear off quite quickly so it is worth keeping a store of games, books and toys to keep the young crew members amused. For the similar reasons it is also sensible to make regular stops on dry land. Nevertheless children should be encouraged to get involved, whether by steering, charting a course, rowing the dinghy or even scrubbing the deck. This might spark in them a passion to pursue boating on their own in the future, or at the very least make future excursions more bearable! Toddlers can be the most difficult crew members and so it is sensible practise that if there is one adult in charge of helming the vessel another is in charge of any small children on board. This is especially important when carrying out careful manoeuvres such as sailing in and out of harbours. Some hire fleets offer child netting attached along the side rails as an optional extra. The Royal Yachting Association (RYA) has devised a number of daysailing and yacht cruising courses suitable for under 16s and which are taught at centres and clubs across the UK and at specialist holiday sites abroad. The RYA’s Youth Sailing Scheme teaches the basics of daysailing in four stages of courses and provides a great grounding for all future sailing pursuits. RYA certificates are awarded for course completion and can be used in other areas of sailing study or as part of the Duke of Edinburgh Award Scheme. The programme is usually completed in small dinghies sized according to the student and each course occupies a minimum of two days training. Upon completion of the level 3 course there is the option to take the advanced modules of the National Sailing Scheme, which teach skills such as seamanship, racing, cruising, using spinnakers, and high-performance sailing. There are also opportunities to get involved in yacht cruising where young sailors can a join a working crew and get to grips with skippering a vessel. Those children that take to sailing and decide they want to get involved on a competitive level can join in the RYA’s National Youth Squad programme. This is aimed at young sailors who want to develop their sailboat racing skills and take them onto a world class stage. The programme consists of up to eight weekends over the course of one year, at camps at a variety of inland and coastal locations. It includes tuition from the RYA National Coach, fitness and sports science days and competition in a number of domestic and international competitions. To be eligible candidates must be under 19 in the year of selection and able to compete for Great Britain at the Olympic Games. If children are well looked after and encouraged to get involved, family sailing experiences can not only provide enjoyable holiday adventures but might also inspire a sailing passion in the young crew.